One of the most annoying things about moving is trying to find everything again. Here we are, more than a month after we moved, and still we can't find certain things. The other day, it was the pizza stone - it turned up in the bottom of a box filled with random electronic bits and bobs. Today, it is two travel mugs. They aren't particularly special or important, but they are useful, and the simple fact is that they do not seem to be in the house. It must be kitchen gnomes, because I am sure we didn't leave anything behind, and I am certain that these two cups would not have been among the things we donated to Goodwill when we left. So, the only logical conclusion is that I did indeed unpack these cups, or repacked them in a logical place, and then the gnomes took them. That must be it. 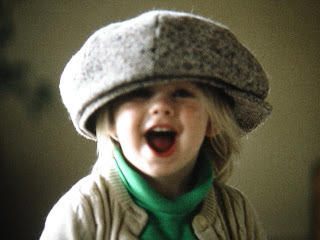 Yup, that's me, wearing one of his hats. The baby in the snuggly is me too - hard to believe, huh? I spent a lot of time that way, or on his shoulders. What a great dad! According to the calendar, we are now official in autumn. According to the thermometer, we are still in summer. Here in Brockport we are supposed to reach 90 F today, after being near 80 yesterday. It thought it was supposed to be cold here! Yeah, yeah, I will probably be thinking back on this day with longing in another month or two, but at the moment, I wish it were cooler! The weatherman does predict cool and rainy by the end of the week. I hope he's right. I think this is my new favorite chuckle and snort of the day blog. I am one of those people who makes note of all the bad grammar and punctuation as I read the newspaper, a habit that made reading the student newspaper very painful. At last, I know I am not alone (well, I knew that - Benjamin feels the same way) in wondering what is up with people who have to throw quotation marks around everything - Benjamin calls them scare quotes...I am guilty of the overuse of parentheses and dashes, and maybe even the triple dot, but those can all be put down to authorial voice - there is no excuse for scare quotes! In other news related news, the New York Times has ended the Times Select program/policy - for which I am profoundly grateful. For those of you who don't know, the NYT started putting certain articles and columnists (usually the most interesting ones) in this category called Times Select, meaning that if you wanted to read them online, you either had to be a subscriber to the physical paper (and why would you want to read an article again online if you have it in front of you at the breakfast table?) or to the Times Select plan. I was able to get around it when necessary using UT's subscription, but it was a cumbersome process. Now, however, they have decided to end the policy, so everything is available once again. Read about why they decided to end it here. I have been going biking 2 or 3 times a week for a while now. I can go either east or west along the canal. The farthest west I have made it before turning around is the town of Holley; the farthest east is Adams Basin. The biggest problem is that the scenery doesn't vary much on the canal from day to day, apart from the changing leaves on the trees, and the occasional boat. The route to the east has stretches that are more isolated, meaning that there isn't a road directly alongside on either side of the canal. These stretches make the canal seem like a river in the wilderness - until you come upon the golf course... If I go east, I can stop at the library on the return trip. I can't take too many books though, because I have relatively small cargo space in my backpack/water bottle Camelback. This way home also involves a grueling climb up the ramp to the bridge I take to cross the canal (well, its not on the scale of the Alps, but still, at the end of a long ride, it is tough). This morning I passed a tug boat pushing a barge. Does that make it something other than a tug - a pudge perhaps? Anyway, a working boat. On Fridays I tend to see more pleasure boats/rental vacation barges. These are sort of replicas of the barges that used to ply the canal - if you have ever seen the animated version of The Wind in the Willows you would recognize them. They are like the barge that rescued Toad when he escaped from prison, and later stole the barge horse... I assume that people rent these for the weekend, to putt along the canal and visit the small towns. Seems like it could be fun. There is a place on top to strap bicycles. Many times the people on the boats will wave. When you pass someone walking on the path, it is polite to at least nod, with a smile on your face, and add a hello or "morning," if you aren't too out of breath from sprinting. When you overtake someone, you are supposed to give an "audible signal" to let them know you are passing. I had Dad send me the bike bell I used to use as a kid, but I haven't put it on the handlebars yet. Actually, he sent two - one that is a nice sort of ring, the other a raucous clang - that one is from Japan, and I suspect it is best employed in traffic. It might make the people in front of you jump in the canal! You don't pass as many people during the week as you do on Saturday or Sunday morning. Some days I see many critters, some days less. Today was a less, although I did see some mallards, squirrels, and a small, unidentified heron. The other day I passed within 10 feet of a Great Blue Heron, twice. These birds are quite large (as indicated by the "Great"), and it is really neat to see one so close. If you go for a walk or a ride closer to sunrise or sunset, you will probably see a lot of fish jumping - feeding on the small insects that abound at that time of day. There is sometimes a headwind that makes the going tough - I have to peddle as hard as I can just to keep going. This morning the wind wasn't very strong, but my ears started to ache with the chill and the cold of the wind I generated just by biking. If I plan to bike once it starts getting really cold I will have to get some kind of ear warmers that fit under my helmet. While Benjamin is off in Austin having fun (ha ha ha), I went out to pick apples. Growing up, we picked strawberries, raspberries, and blueberries - the summer could be measured by what was in season and what we would be picking next. 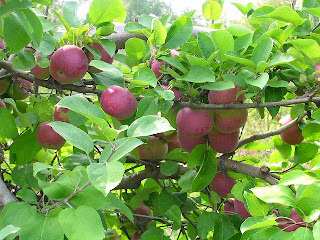 In the fall, when I was very little, we would drive to Wenatchee to buy boxes of apples and peaches, but apart from the apple tree in our yard, I had never picked apples. This farm has at least 19 varieties, only 3 or 4 of which were ripe today. 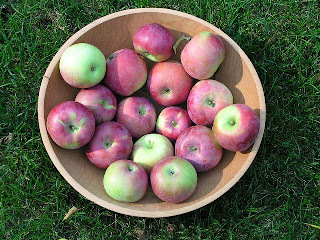 I picked 5 pounds of Macintosh and Jonamac apples today. It wasn't really the best weather - hot and humid, not the autumnal cool that you might picture. Ah well. The picking season goes until the end of October, so we will be going back. On to the pictures: Before And after: There is now one less than in the bowl, because I ate it. Yum! I would have liked to pick more, but there are only two of us to eat them. We don't have a dehydrator, so I can't make dried apples, like my dad would. I can only make so many apple crisps, pies, and applesauce. Again, there are only two of us. I know we will get some and keep them in the basement, where it is cool and dry, for as long as we can, but they won't last forever. That is the problem with eating in season - seasons change. I plan to make an apple crostata (sort of a rustic tart/pie) for Benjamin to celebrate. HE DID IT! Benjamin has passed his defense and can now be called Dr. Rider! Wahoo! Benjamin is in Austin, and will be defending his dissertation Friday morning at 10 (Austin time). Good Luck! Twice today I was behind cars, well jeeps or SUVs really, that had tire covers with pictures of the American flag and the slogan "There is only one." For some reason this bugged me. I mean, these are probably some of the same people who want the 10 Commandments in schools, and yet, they are practically turning the flag and the country into a new god to worship. There is so much wrong with that, but I don't really want to end up on a government watch list, so I will just leave it there. OK. I am the first to admit that I am behind the times when it comes to digital communication. 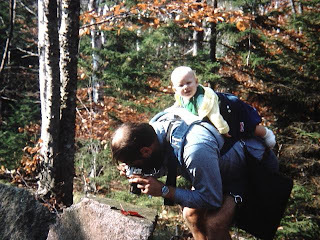 It isn't that I am a Luddite or anything, because I love email, spend far too much time surfing the internet, and hello - have a blog, but until today, I had never ever sent an instant message (IM for short - in case you were wondering, Mom). I knew about IMing, and many of my friends spend many hours a day doing it. I had just never done it - partially because I always maintained that I waste enough time as it is without adding to it. We have been vermicomposters for 3 or 4 years, using a worm "farm" we bought on the Internet to turn our vegetable and fruit scraps into lovely worm dirt for our plants. When we moved in August we decided to give away our worms and bins, with the idea that we would start over once we got up here. The worm farm was a good starting tool, but it wasn't really big enough, and it was sort of flimsy. Starting over, however, is turning out to be more difficult than we anticipated. First of all, we wanted to build a nice big wooden bin, but we don't have any of the tools necessary to turn a piece of plywood into the smaller pieces needed to build the bin. The next option is to use plastic storage bins, but they need to have holes drilled in them before we can actually put worms in them, because the worms need plenty of air circulation. Also we need to get the actual bins. So, today I set off to Home Depot to secure a drill and the bins...and came home with a lot of bulbs to plant in the garden, and a drill, but no bins. I stopped at Wal-Mart (I know, I know, Satan's shopping market - I don't want to shop there, but I don't have many options out here) but they didn't really have what I was looking for. Well, to be more precise, they had something that would work, but the bins were missing lids, and I need the lids to keep the worms in the bins, and the pests and cats out. I will now have to drag Benjamin out to Wal-Mart and hope that the lids have materialized in the meantime. We just played quite the racquetball match. I won two of the three: 7-15, 15-6, 20-18. For those of you who don't play racquetball, a regular match goes to 15, and the winner has to win by 2 points. Benjamin just blew me away in that first game, but then the teeter-totter tipped for the second game. The third one was a battle. I was up 6-2, then had to come back from a 14-9 deficit. Whew. The woodchuck in our back yard has been diligently fattening itself up lately. He/She sets up camp beneath the bird feeder and hoovers up whatever tidbits have been dropped by the careless birds. If you make a movement or a noise, it darts off towards the corner of the yard where there is a small hole under the fence, where it can take cover in the bushes. Once it deems it safe, the woodchuck comes right back to the feeder to keep eating. After all, food is serious business. Time to catch up on the various things that have been percolating for the past day or so, just waiting for a chance to make it onto this space. Hard to believe, but we've been here a month, and fall is most definitely on its way in. Friday was warm and sunny, near 80 F, but Saturday barely got above 55 F! Today is quite nice, sunny and warmish, but it was pretty cold when we got up. We haven't turned on the heater yet, so it was about 63 in the house. When I told my mother this, her first response what that it was very cold - then I pointed out that this was where she kept the temperature the entire time I was growing up, warmer in fact. Anyway, the cats have been letting us know they are cold. Cleo keeps burrowing into the covers once we get out of bed (and after she has bullied us into feeding her) to capture whatever warmth is still there. I know, it is still a long way from as cold as it is going to get - but you have to admit that it is a big change from 93, which is what it was a week ago. Austin won't hit 40 until December or January. I've gone a little overboard with books in the past week. I visited the library and came home with 4 books, and had 5 more on hold. On my way home from my bike ride this morning I stopped to pick up what I thought would be one book, and it turned out that all of them were ready. I had to leave two behind to pick up later in the week because I only had my Camelback backpack, and the cargo space in it isn't that big. It turns out that the library charges for holds, 50 cents a book. I am of two minds about this: as a librarian, I applaud the library system's attempt to help cover the costs of a very convenient service - I mean, moving those books around all over the county costs money, and gas ain't cheap. But as a patron (and a cheapskate) I resent being asked to pay for something at the library - don't our taxes go to cover that kind of thing? Late fees yes, I understand, copies yes, but charging me for getting a book on hold? Also, why was there no very visible warning on the web site when I first placed the holds? I might have thought twice about a couple of the books. So, I paid the money without any protest (but they were lucky I had money in my wallet for once), trying to be understanding, but I did some muttering under my breath as I unlocked my bike and headed home. 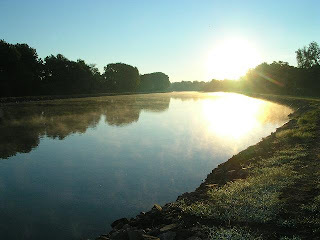 I passed two boats on my ride this morning, as well as a great blue heron. I was within 10 feet of the heron, twice, as I rode past. The first boat was a sailboat that had unstepped its mast (thanks to Bonny Anne for teaching me that term - I just hope I have used it correctly) and was puttering along slowly. The second was a largish cabin cruiser type boat named "Posh," like the Spice Girl. It was going rather more quickly, and kicked up quite the wake. I passed this boat twice - once on the outbound leg of the trip, and again as I returned. The second time I had to peddle faster to get ahead of it, and out of the smell of diesel, but I didn't have to peddle too hard, because boats just don't go that fast on the canal! For those of you who don't get up early enough to listen to NPR's Weekend Edition Sunday, here is a link to the short interview that host Lianne Hanson had with Richard Oram at the HRC about rejection letters from the Knopf files. I worked on some of those files! A quiet weekend again. We are sort of falling down on the exploration/adventure front at the moment, but we did get out of the house a couple of times. On Friday we went in search of Mexican food in Irondequoit, a suburb of Rochester, about 30 to 40 minutes away. It wasn't bad - not necessarily up to Austin standards (but those are pretty high) - but good enough to satisfy an enchilada craving. As Benjamin pointed out, the only problem with it was that the decor was too bright and cheery. All the good Tex-Mex places in Austin tend to be a bit darker and tackier (velvet Elvis at Chuy's anyone?) with more beer sign ads. Saturday we drove to Pittsford, another Rochester suburb, to go to the large, fancy Wegman's grocery store and compare it to the Brockport Wegman's. Again, a 30 minute drive. It was impressive looking, and had a lot of good looking prepared food, but in the end, not worth the drive. Too many people, not enough special food. Heck, they didn't even have frozen, unshelled edamame, which doesn't seem that exotic to me anymore. I miss the bulk bins at Whole Foods and Central Market. I am going to have to visit the natural food stores in Rochester to find quinoa and other bulk foods. That disappointment aside, I do like all the fresh foods we can get here right now. We bought local grapes yesterday. They actually smell like the grape flavor used in candy, and are completely different from the grapes you usually get at the grocery store. At the farmer's market this morning, I had my pick from 4 or 5 types of apples. I bought two kinds of squash, tomatoes, onions, a cucumber, red bell peppers, lettuce, carrots, and some of those apples. Next weekend Benjamin will be in Austin, defending his dissertation. I might go pick apples, but otherwise the adventures are on hold for a couple of weeks. We might try to go visit friends in Albany in early October, and another friend in Ithaca once the foliage is in full color. So, we will do better, I promise. We went for an early morning walk along the canal today. It was a gorgeous morning - a little nip in the air to remind us that summer is just about over, and sun to make us forget that fact. There was a light fog rising off of the canal, and dew on the plants. The recent rain has prompted the grass to grow, and there are delicate little shoots poking up through the mud. Lovely. Yup, it feels like fall is just around the corner. Some of the trees are starting to turn, and we have had rain off and on every day since Sunday. I had to fight the wind on my bike ride this morning, and it was cold enough that I dug out the warm up pants. Last night, a strong thunder storm blew in, with heavy winds and rain. 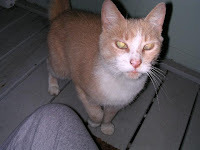 Because we are such softies, we brought Creamsicle (who I think I will rename Bella) into the garage - out of the rain and wind - and fed her. We can't bring her into the house because of Cleo and Oliver - we don't want to expose them to anything she may be carrying, and they aren't fully inoculated against diseases, since as indoor only cats they don't come into contact with other cats. I think we are lost - if she is still around in a couple of weeks I will take her to the vet, get her checked out etc, and bring her into the house. Sigh. It isn't that I don't want another cat, but I did want a dog, and I don't really want to upset the balance between Cleo and Oliver. Last night I had a dream that Benjamin and I were walking through the woods when we saw a snake. "It's a copperhead," said I, "we should get away from it." So we started walking away, but the snake chased us and bit Benjamin in the leg. I was worried and tried to call 911, but kept getting stuck in a maddening automated phone directory that would only give me little platitudes ("We're sorry and hope you feel better soon") (this was actually scarier than the snake bite, since Benjamin seemed fine and the likelihood of him getting a snake bite is pretty slim, but the phone thing could actually happen!). The spooky thing happened after we were awake and getting going for the day. Cleo found one of the three small plastic toy snakes we have and started playing with it. She has never shown any interest in them before, although they have been out and about for years. Anyway, she carried one into the bed room and put it on Benjamin's side of the the bed. The snake? You guessed it - it was a copperhead. This is our fire pit at the end of the back yard. I spent some time last week cleaning it out - it was overgrown with all sorts of plants. Now we just have to get some fire wood and we can make s'mores and stick biscuits... Yum! We were planning to camp out in the back yard one night this weekend, but Friday was too hot, and Saturday we didn't get the tent out until 10 PM, at which point we noticed that both neighbors had large halogen lights on, illuminating not just their yards, but ours as well. We gave up. Maybe next weekend. Is this not one of the dumbest ideas ever? If it is hot enough to wear flip flops, it is too hot for a shearling lining. If it is cold enough to need a shearling lining, it is too cold to be wearing flip flops. Right? I just counted, and I have only read 51 books so far this year. My dad is already at 70ish. Yes, I was in school and really busy for the first half of the year, but I am going to have to do a lot of reading in the next few months if I want to break 100... At least I am not like the 1 in 4 Americans who didn't read a single book last year! No problems at the DMV yesterday. I brought all the necessary forms and pieces of ID, unlike several of the people in front of us in line (hint - if it says that you will need your SSN to get a license, bring it with you, then you won't have to go home to get it!). In fact, apart from having to wait about 45 minutes (not bad for the DMV actually), the hardest part was getting the adhesive from the Texas registration sticker off of the windshield in preparation for the NY sticker. Huh. I went and got the car inspected this morning, so we are all set (apart from the actual licenses that will take 10-12 days to arrive in the mail. We only have little paper slips for now). I also went and obtained my new library card this morning. Whee. For a small town, the library is quite nice - a fairly new building, and a nice selection of books. It didn't have some of the more "literary" books I was looking for, but that isn't surprising. I usually had to get that kind of thing from the UT library anyway. Maybe I can convince Benjamin to check some things out at Brockport. Speaking of Benjamin, he signed us up for the faculty gym membership, so we are going to play racquetball this afternoon. We checked out the courts one day when we were wandering the campus - they aren't as nice as the courts at UT, but I bet most schools don't have gyms as fancy as that. Here, they are in the basement, kind of like dungeons, and they have the little tiny hobbit-sized doors. If you hit a ball out of the court, you are out of luck, because you have to go up the elevator or a hidden flight of steps...There may be other courts in a different building somewhere - you can bet we will try to find them! But at least there are racquetball courts to go to. After last our far-ranging adventures last weekend, we plan to stay close to home this weekend. There is some sort of town fall festival on Saturday, so we will probably walk to that. Maybe another bike ride on Sunday? I'm afraid I don't have any interesting goings on to report today. The Mariners lost again last night, having one terrible inning, after starting the game very well. At the U.S. Open Andy Roddick lost to Roger Federer, which isn't surprising, seeing as Federer is possibly the best male tennis player ever (if only I could play racquetball a tenth as well...), but is still disappointing. Like to have an American (from Austin, no less, even if it is only part time) in the U.S. Open. Neither of us follow tennis that closely, but we got hooked on the majors when we were in England on our honeymoon, at the same time as Wimbledon. We'd go out sight-seeing every morning, and come back to take a siesta in the afternoon and end up watching tennis before heading out for more culture. WE watched Roger before he won anything, so there. So, we make a bit of an effort to watch the big matches at least. Unless Roger does something stupid, like spraining a wrist while signing autographs, it looks like he will be champion again. The women's side is more open, with both Venus Williams and Justine Henin still playing. I think they play tomorrow. Whomever their opponent is in the finals (assuming one of them makes it) is probably just cannon fodder. Anyway, I did some Tai Chi this morning, sans rain. Indeed, today is supposed to get close to 90, as is tomorrow. Tuesday barely got above 60. Strange weather patterns here. I guess it is the influence of Lake Ontario? I also went for a bike ride this morning. I decided to try and do wind sprints - where you sprint all out for a set period of time then go normally for a time, then repeat. It is supposed to build endurance if you do it regularly. It may do that, but for the moment all I can tell is that it has tired my legs out. We are off to the DMV this afternoon to try to get NY state driver's licenses and get the car registered here. According to someone I talked to the other day, getting a new license has gotten incredibly difficult, requiring about 10 forms of identification to prove you are who you say you are. Luckily for us, we already have licenses, and just need to exchange them - and even this takes about 4 forms of ID apart from the licenses. If anything interesting or infuriating happens, I am sure I will report it here later today or tomorrow. Oh yes, we just got our new recycling bins. Hurrah! We will be getting a trash bin too, but they are on back order until next week or later. Who knew trash was so popular? So much for sweeping the Yankees. The Mariners lost last night, 12-3. Sigh. I think I am about ready for hockey season to start. At least every team has a chance in the first month of the season. Also doh to myself - I have spent far too much time lately playing on the computer, and not enough time practicing Tai Chi. I am not sure why I do this - I always feel worse after sitting around doing nothing, and better after doing TC. I think I am just lazy unless I have some form of accountability or authority figure demanding a report. I mean, I always work hard at jobs and I always did my homework to the best of my ability - but I had to turn it in, and my supervisors expected results. I always have good intentions, but I always find it hard to follow through. And now that I am no longer taking TC classes, I don't have a built-in support group. Well, I WILL practice today, and I will start reading the book I just got about TC. This blog has now become my task master! After I posted that first bit, I went out and did my form in the backyard. About 5 minutes of embracing horse, then I started the form. I stopped after the first section and started over, because I was going too fast. On the second try I clocked in around 27 minutes, but I think I can be forgiven for speeding up a bit, because it started to rain when I was about 10 minutes from the end. The form itself was a bit sloppy though, even before the rain. That is what comes from not practicing often enough! In other news, we went for another 10 mile bike ride this afternoon. That makes 4 in the last 8 days. Pretty good. Today we had to fight against a strong headwind on the way home. I hate the wind! Oh well, I guess it is good for me - makes me work harder and burn more calories. Of course, then I come home really hungry - just have to avoid the chocolate I guess. We are enjoying a pretty quiet long weekend. Yesterday we went to the local farmer's market for fruits and vegetables, and the grocery store. We are watching a lot of tennis (it's the U.S. Open at the moment), now that we have cable. 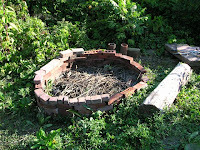 I spent some time this morning cleaning out the fire pit in the backyard so that it is usable. Once we get some firewood, we will be able to have a campfire, which will mean we can roast white hots (Rochester's specialty hot dogs) and make s'mores...Yum! Other than that, the only other things I have done today is mop the kitchen - whee. Our adventure this weekend was a trip to Toronto to watch the Mariners play the Blue Jays. 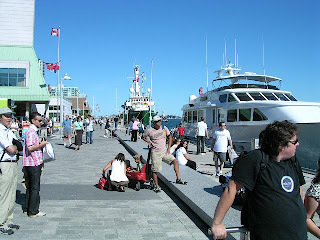 We went to Toronto on vacation a few years back, and liked and wanted to return. As soon as we found out that we would be moving to Brockport, we started planning this trip - we try to go see the Mariners whenever they come to town. In Texas, we watched them play in both Arlington (Dallas) and Houston. Up here, Toronto is the closest baseball city... So here is the tale of our Saturday Labo(u)r Day Weekend Adventure. Anyway, we made it through in plenty of time, which made us careless. We had three goals (well, Benjamin had two, I had a third) for this trip: Baseball and IKEA. 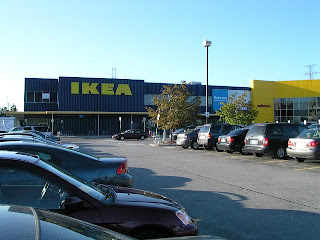 There is no IKEA in this corner of NY, so we had to go to Canada. Anyway, we had so much time left before we were due in Toronto for the game that we decided to stop at IKEA for a little while on the way. 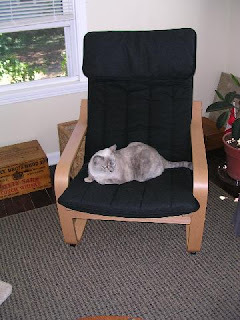 We cruised through, found a chair we liked (more on that later), and decided to come back on the way home, rather than having the chair in the car in Toronto. We also stopped at a grocery store to fulfill my third goal, fennel tea, and get some lunch. But, as I said, we got careless. I had been so focused on the border that I completely forgot that we were driving towards a big city on a holiday weekend, and the inevitable corresponding heavy traffic. Until Burlington, where the IKEA was, we had been zooming along at 110 km/hr (70 mph). After Burlington, we were only going about 50 mph. The closer we got to Toronto, the worse the traffic got. It took 30 minutes to get from the "Spadina Ave 2 km" sign that marked our exit, to the actual exit. Sigh. By that point it was 1 PM, and the game started at 1:07. Luckily we found the parking garage and a parking spot quickly, but then we had to buy the parking permit...In this garage you did not buy the permit from the attendant on the way in, no, you bought it from a kiosk once you parked the car. Now, this seems like a decent way to do things, except for the fact that no-one could get the things to work. They were supposed to take cash, and we had stopped at an ATM specifically to get cash for parking, but they didn't. They would only allow you to swipe your credit card once for a ticket, which seems reasonable, but several of the people in line in front of us did not have a credit card with them, so other people in line traded cash for a use of their card, which then meant that they could not buy their own tickets...We had to wait behind these people as they tried to figure out what was going on. Then we had to buy our tickets for the game tickets. Sigh. In the end, we missed the first inning, but since nothing happened, we didn't miss too much. All because we got through the border too quickly...If we hadn't, we would have gone straight to Toronto and would probably have been in time. We had decent seats in the outfield, looking down on Ichiro and Raul Ibanez. Too bad nothing good happened in the game. The Mariners lost their 8th game in a row. The pitching was good on both sides, and the Ms just couldn't score, or hold the tie they eked out in the 8th. This picture shows the most exciting things I saw all game: Ichiro taking off his shoes in the middle of the game (during a pitching change). When we got back to the garage, about 45 minutes after the game got out, it was not empty. Indeed, the cars in line were not moving. It took another 45 minutes to get out of the garage. Then, in yet another traffic-related miscalculation on our part, we decided to try and drive around a bit of Toronto and see the sights. Not a good choice. Spadina, the street we were on, was bumper to bumper and not moving - every light only about 2 cars would get through. Then, as we tried to abandon the drive, we got stuck on another street that was in much the same condition. The neighborhoods we drove through were probably interesting to walk in, with a lot of funky shops and restaurants, but they were not fun to drive through at less than 5 miles an hour. It took us more time to go 4 miles yesterday than it did for our 10 mile bike ride on Friday afternoon. And it was hot. Our car doesn't have A/C, so the most we could do was roll down the windows, but that is only effective if you are actually moving. Sigh. The third goal I had was to get some fennel tea. I was introduced to this tea when I was studying in Scotland, and really grew to like it as an after-dinner drink. 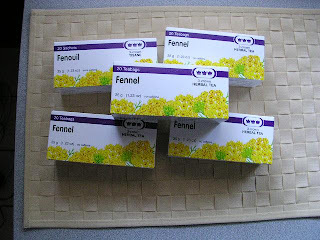 The problem is that fennel tea is not easily available here. I have looked all over, and have only found it once or twice in 7 years. When my parents went to Scotland on vacation a couple of years ago, I had them bring me back what turned out to be about a year's supply. Louise brought me some from Canada, but it didn't last very long. So, I was determined to find some this trip. Luckily, there was a grocery store next to the IKEA, and I got myself 5 boxes. I am a little worried that this will not be enough, since it is only 100 tea bags, but I guess it will have to do until I can get back to Canada. We had one last traffic issue last night on our way home: a broken down train in the middle of the town of Bergen. We were less than 10 miles from home when traffic came to a halt. After we had been sitting for about 15 minutes, a sheriff's deputy came by and told us to follow the people in front of us to get back to Brockport. Thus ensued a high speed chase through the dark and back roads on Monroe County, as Benjamin tried to keep up with the caravan in front of us. This was accompanied by the strains of the "William Tell Overture" that happened to come on the radio at the time. Whew! I think we shall be staying home next weekend!